What do Keno and the Great Wall of China have in common? Well, the former was the reason why the latter was built. It’s not hard to see why it’s been captivating so many people. Buckle up and get ready for some explanations on what Keno is. How about that Great Wall of China, huh? Well, what if I told you that it wouldn’t even be there if it hadn’t been for one game of chance? You read that correctly — this gambling game was the reason why the Chinese were able to fund one of the most fascinating landmarks in the world. So next time one of your family members criticises your love of gambling, just remind them that casino games can be a source of good as well. Keno was created in ancient China thousands of years ago. People passed the same story about its origin from one generation to another. Namely, during the period of the Han Dynasty, there was a war that the city had to fund. However, after some time, the citizens became weary of it and afraid for their safety. Thus, the army stopped receiving financial help from them. As they faced losses, the government came up with a plan — they were going to promote the game of Keno to the people so that they could raise money for the army. Well, Keno financed the war, which resulted in the dynasty’s victory. Hooray! Also, Leung based Keno on the poem “The Thousand Character Classic.” The poem taught Chinese characters to children. He took 120 characters to produce the game, and after that, people began to gamble. Of course, the modern-day version of Keno has changed to include certain features that can increase the player’s odds. I will explain the basics of it below. Now, this history is enough to nudge anyone to check out the rules. From what I’ve gathered, this game is popular in online casinos — not only in land-based ones. And it is not that hard to understand the gist of the game. To begin with, you have a keno ticket at your disposal that’ll probably remind you of bingo. And the layout is similar. Namely, on a keno ticket, you get a grid with numbers ranging from 1 to 80. In addition, every player needs to select a set number of spots. Some play slips allow you to opt for between 1 to 10 numbers. However, there are casinos which include 15 spots on the ticket. However, the actual number varies, and you’ll find different versions from casino to casino. But most importantly, players cannot choose more numbers than the ticket offers. And probably for the best — each additional number might lower your prize. This is a clear indicator that you need to have luck on your side to win. Who knows — maybe you will get the winning numbers! If you want to try Keno out, I’d recommend you to participate in several consecutive games. Needless to say, every additional draw increases your chances of winning. See? This isn’t difficult, and just like the lottery, this game might become an integral part of each household as well. Now that your ticket is ready, all you have to do is wait patiently. If you are in a casino, then you’ll have a Keno monitor that tracks the game progress. Also, 20 numbers are drawn. Some casinos use a ball machine, while some opt for a random number generator. The former might transport you back in time when bingo was in its heyday. On the other hand, the latter uses state-of-the-art technology which will undoubtedly sit well with tech-savvy people. Besides, whether the casinos use RNG or the old-school ball machines, they promise that the results are always random. Casinos often refer to payouts in Keno as paytables. In order to figure out how much you will get, then you should know how the casino calculates the winnings. Namely, they will look at how many numbers you’ve selected, as well as how many of them you’ve actually matched. Besides that, your wager plays an important role as well, i.e., whether it’s $1 or $5. Unlike many other casino games, Keno has a high house edge. In most cases, it is between 4% and 35%. Just to remind you, a variety of different games have a house edge below 5%. For this reason, one review site investigated Keno games in Las Vegas. They established that their house edge ranged from 20% to 35%. Hence, this game doesn’t work in the player’s favour. 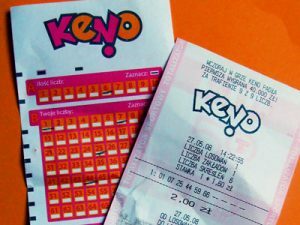 Nonetheless, if you approach Keno expecting entertainment rather than getting rich, then you will undoubtedly enjoy it to the fullest. Like most games, Keno has certain terms which you should get hold of if you want to play it actively. I’ll mention some of them below. All or nothing — sometimes, casinos decide that they’ll pay out their players only if they get all the spots right. They call this all or nothing. Call — this is when casino employees call the drawn numbers. You should refer to them as callers. Catch a spot — if you guess a number, then an employee will tell you that you have caught a spot. Combination ticket — one Keno ticket that enlists a number of bets. Conditioning — in other words, the Terms and Conditions for Keno that casinos add on the tickets. Goose — you can use this one to refer to the ball machine. Handle — the entire sum of money a casino raised during one shift. Keno writer — a casino employee that helps with tickets and pays out the winners. Outside ticket — once a player lands a win, they goe to show their ticket to a keno writer and gets their prize. This is, thus, an outside ticket. Race — typically refers to a single game of Keno. These are just some of the recurring terms in Keno. It is always helpful if you are familiar with them, and who knows — you might just approach a keno writer with your outside ticket. To sum up, this is a game with an interesting history. People played Keno thousands of years ago. The fact that it withstood the test of time for so long should be enough to prompt you to at least try it out. But don’t forget — this is not a game of skill. Therefore, don’t sweat if you’re not on a winning streak. Sometimes, luck needs to be on your side in order to go home with a prize. Previous Previous post: Bingo! Alex Just Won $7,777 and He Cannot Keep Calm!